In 1795, Poland ceased to exist and most of the area of Belarus (within today’s boundaries) was annexed by the Russian Empire. The city of Grodno became the capital of the Grodno province (Gubernia) which consisted of nine smaller administrative regions (Uyezds). Lunna was included in the Grodno region, Grodno province; see map of Grodno Gubernia (1834). Until 1915, the Grodno area remained part of the Russian Empire under the rule of the Tsar. In September 1915, during the First World War, the Germans invaded Grodno region. At that time the neighboring smaller village Wola was officially annexed to Lunna. Many Jewish residents, however, continued to refer to Lunna as "Lunna-Wola". In 1918, as a result of the accord between Germany and Russia, Poland gained autonomy. However, in the period between 1918 until 1921, the struggle between the United Soviet Socialist Republics (USSR) and Poland on the hegemony in Belarus resulted in instability in the area. In 1919, Grodno and its vicinity were part of Poland; but in 1920, the Grodno region was transferred to the USSR. 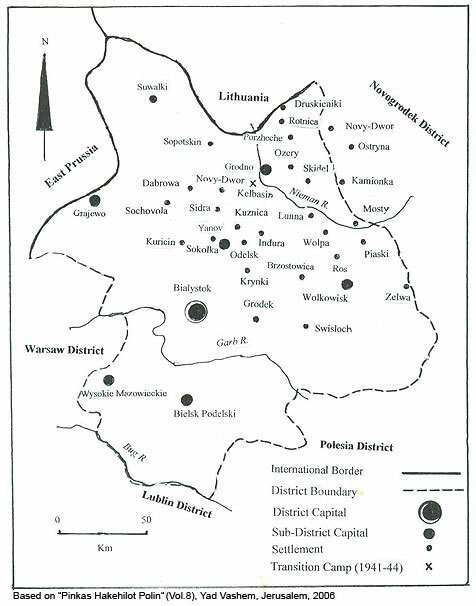 map of the Jewish communities in the Bialystok district (1939). On August 23, 1939 the Molotov-Ribbentrop accord was signed by the Soviet Union and Germany; western Poland was supposed to be part of Germany and the eastern part including the Grodno region was supposed to come under the Soviet control. In consequence, on September 1, 1939, Germany attacked Poland and invaded western Poland, thereby starting the Second World War, and on September 17, 1939, the Soviet Red Army occupied eastern Poland. On June 22, 1941 Germany attacked the Soviet Union. On Saturday, June 28, 1941, the Germans invaded Lunna and on Sukkot evening, September 1941, Wola was declared as the Ghetto for the Jews of Lunna-Wola. On November 2, 1942, the Jews of Lunna-Wola were transferred to Kelbasin Camp located 4 kilometers SSW of Grodno. On December 5, 1942 a transport of Lunna-Wola’s Jews and other neighboring towns left Kelbasin and on December 8, 1942, arrived in Auschwitz Death Camp. Most of the Lunna-Wola’s Jews were sent to the gas chambers and exterminated. Only few of them survived the Holocaust. After the Second World War, Belarus was incorporated into the Soviet Union, and following the collapse of the Soviet Union, Belarus declared independence on August 25, 1991.